Written for Interactions magazine by Hugh Dubberly, Shelley Evenson, and Rick Robinson. 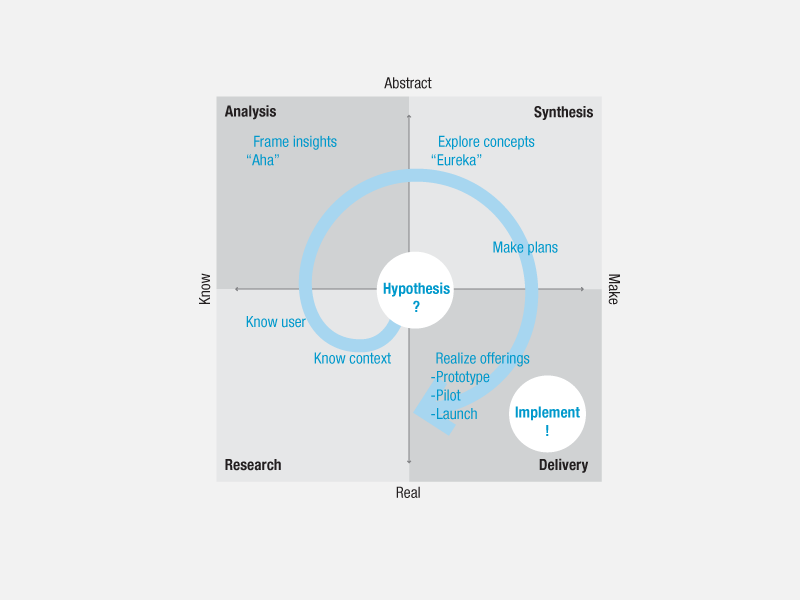 The simplest way to describe the design process is to divide it into two phases: analysis and synthesis. Or preparation and inspiration. But those descriptions miss a crucial element—the connection between the two, the active move from one state to another, the transition or transformation that is at the heart of designing. 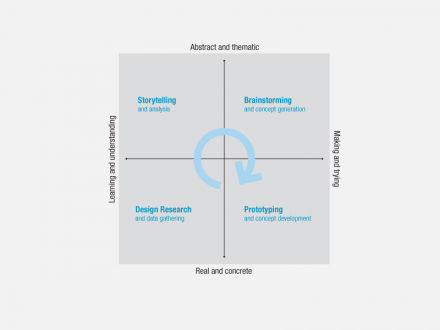 How do designers move from analysis to synthesis? From problem to solution? From current situation to preferred future? From research to concept? From constituent needs to proposed response? From context to form? The bridge model here is organized as a two-by-two matrix. The left column represents analysis (the problem, current situation, research, constituent needs, context). The right column represents synthesis (the solution, preferred future, concept, proposed response, form). The bottom row represents the concrete world we inhabit or could inhabit. The top row represents abstractions, models of what is or what could be, which we imagine and share with others. 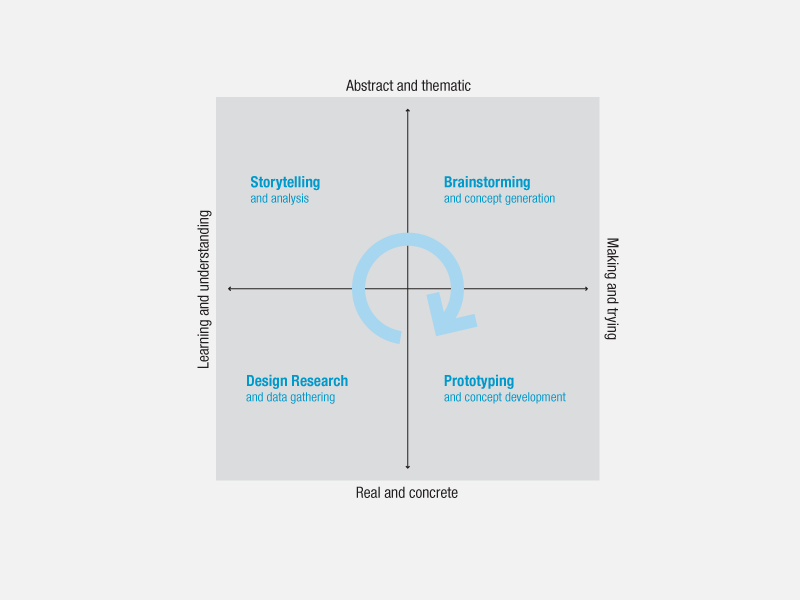 Ideally, the design process begins in the lower-left quadrant with observation and investigation—an inventory (or description) of the current situation. As the process moves forward, it moves to the upper-left quadrant. We make sense of research by analysis, filtering data we collect to highlight points we decide are important or using tools we’re comfortable with to sort, prioritize, and order. We frame the current situation, but move out of the strictly concrete. We define the problem. We interpret. Analysis begins as thoughtful reflection on the present and continues as conversation with the possible. 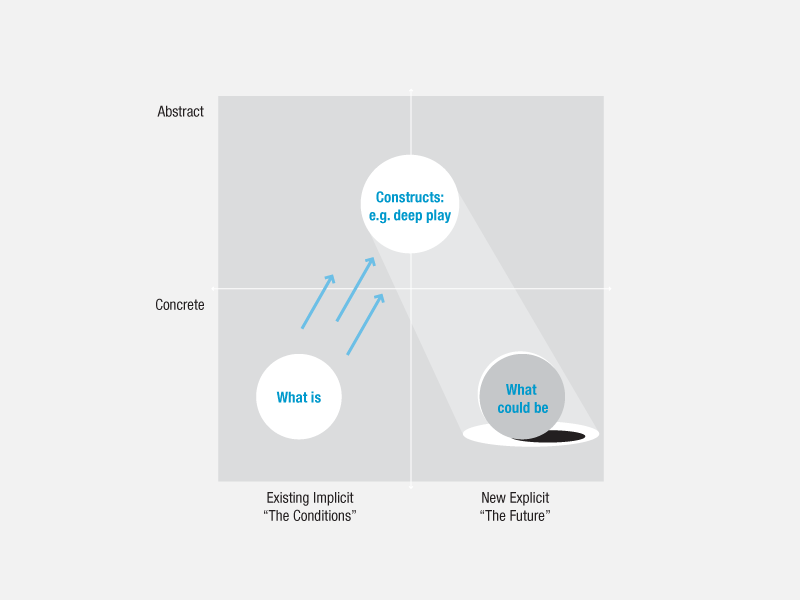 Crucial for progress is documenting and visualizing our analysis, making it possible for us to come back to it, making it possible to imagine alternatives, making it possible ultimately to discuss and agree with others on our framing and definition. We might write down a list of findings or a statement defining the problem. Better still is writing a story. A story describes actors and actions; it suggests relationships, which we may represent in visual form. 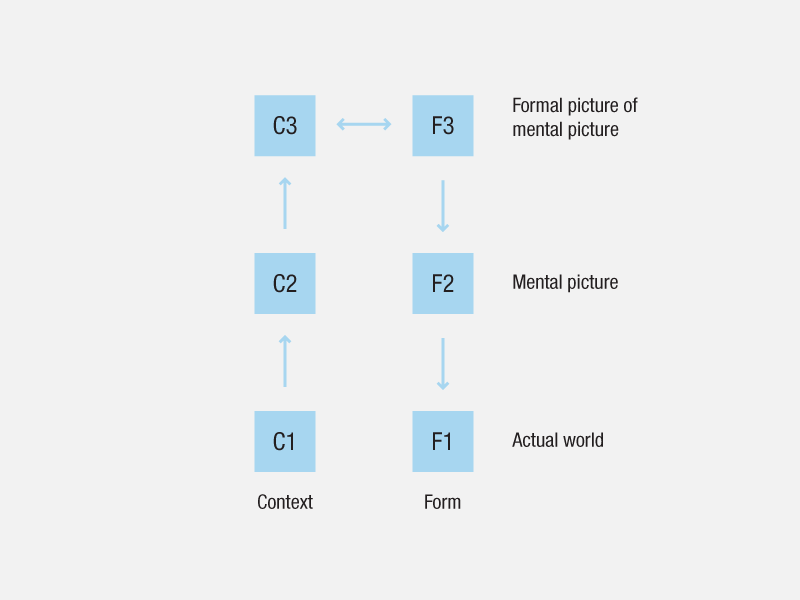 A story of what happens suggests a model of what is—an interpretation of our research. The process of coming to a shared representation externalizes individual thinking and helps build trust across disciplines and stakeholders. Having agreed on a model of what is (framed the current situation, defined the problem) then the other side of the coin (the preferred future, the solution) is implied. An interpretation provides “a description of the everyday in such a way as to see how it might be different, better, or new .” We can devise stories about what could happen. We can model alternatives in relation to our first model. In doing so, we’ve moved to the upper-right quadrant, to the use and development of models of what could be. 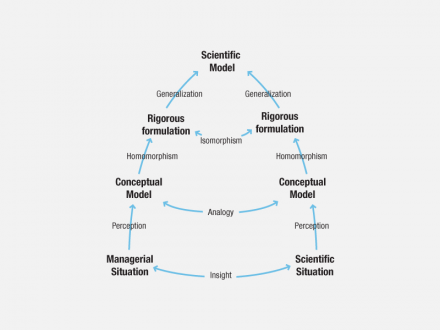 It is in the realm of abstraction—by thinking with models—that we bridge the gap between analysis and synthesis. These models are hypotheses, speculations, imagined alternatives to the concrete we started with, but they are still abstract themselves. It is easy to “play” with models at this point, to test and explore. But design requires that the work return to the concrete, that we make things real, realize our models as prototypes or even finished form. This is the lower-right quadrant. Of course, results improve with iteration. Submitting the new prototype to testing, further observation and investigation, continuing around the quadrants, we learn and refine our work. The bridge model has several antecedents and variations. Writing about the relationship of science to management, Stafford Beer presented a more elaborate model of the move from cases to consensus, from particular to general. He points out that several levels of models are involved . At the beginning of his career, Christopher Alexander described a six-part model. It differs from the bridge model in two important respects. 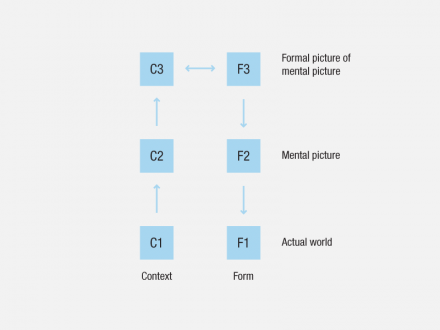 First, Alexander explicitly separates the mental picture (model) from a formal picture of the mental picture (a representation of the model). Second, his notion of a model (at that time at least) was highly mathematical . Vijay Kumar has proposed a model of the innovation process. He frames it as a two-by- two matrix, moving from research, to “Framing Insights,” “Exploring Concepts,” and “Making Plans.” He notes, “’Framing Insights’ are primarily about descriptive modeling, creating abstract mental pictures about the patterns that we recognize about reality. ‘Exploring Concepts’ and ‘Making Plans’ are about prescriptive modeling.” Where the bridge model forefronts the role of models, Kumar’s model forefronts steps that make use of modeling. 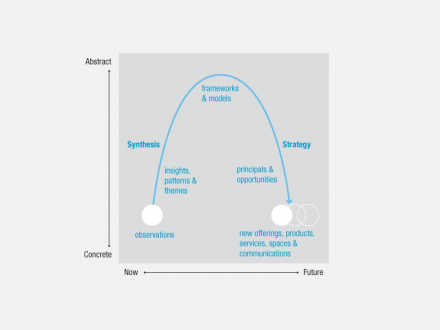 He recently published a wonderful poster that maps the steps in the “innovation process” to a series of methods. During the process of writing this article, interactions co-editor Richard Anderson pointed out this model of the innovation process. Christi Zuber reports that Kaiser Permanente’s Innovation Center (working with IDEO) developed this model in 2004 as part of an innovation toolkit created for use inside Kaiser. 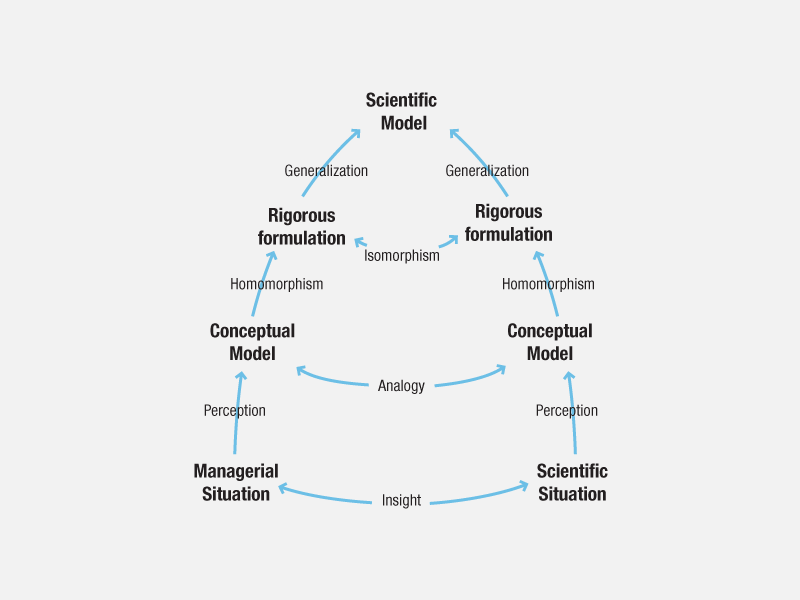 This model is similar to Kumar’s model, but the Kaiser model emphasizes storytelling and brainstorming as key methods. 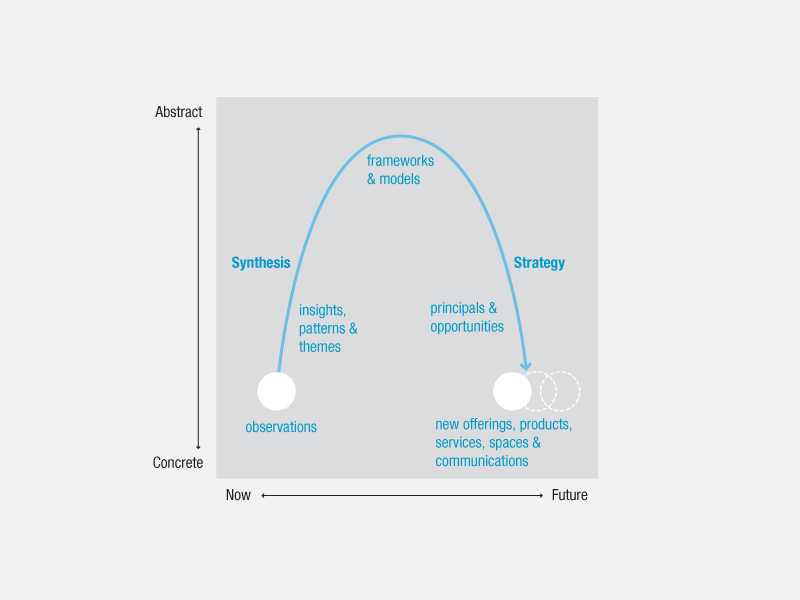 Responding to questions about the origin of the Kaiser/IDEO model, Jane Fulton Suri supplied this recent model of the process of moving from synthesis to strategy. It shares the same basic structure as the Robinson model; though synthesis (depicted as the right column in other models) is here depicted as the left column. The framing of models as a link between patterns and principles is a useful addition . 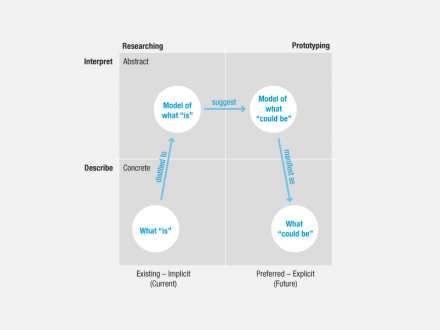 The bridge model makes explicit the role of modeling in the design process. Explicit modeling is useful in at least two ways. First, it accelerates the design process by encouraging team members to understand and agree on the elements of a system and how those elements interact with each other and their environment. Second, by making the elements and their interactions visible, it reduces the likelihood of overlooking differences in point of view, which might otherwise eventually derail a project. 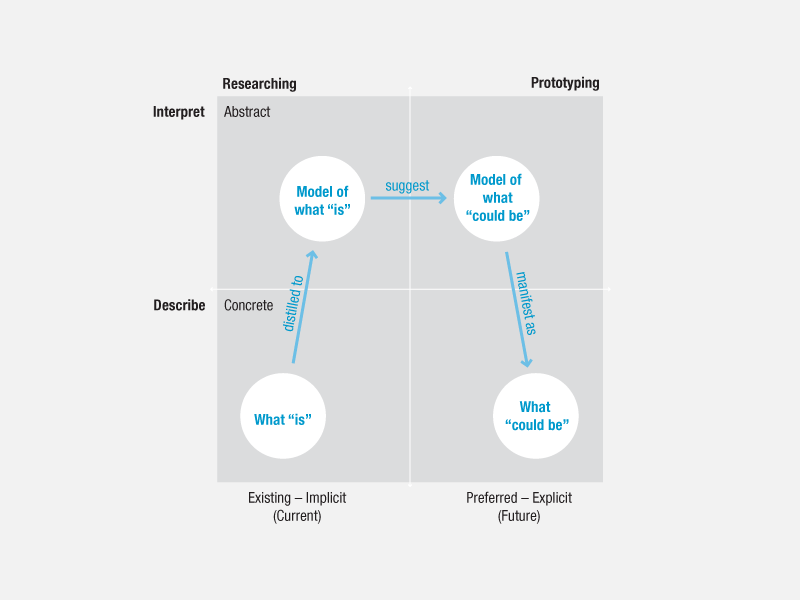 Explicit modeling also helps scale the design process. It enables designers to develop larger and more complex systems and makes the process of working with larger and more complex organizations easier. Discussing the role of modeling in design also invites comparison and interaction with other disciplines that use models. Ideally, practitioners that use models may, over time, be able to see patterns across their models that will advance the practice of design. 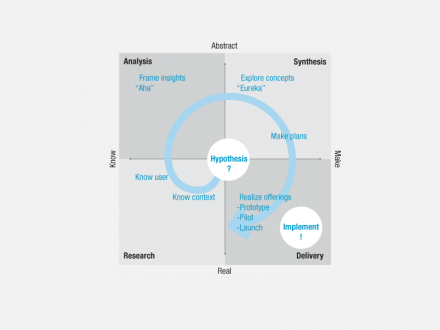 Joanne Mendel and Jan Yeager build on the bridge model in their article Knowledge Visualization in Design Practice. Consider the primitive origins of analysis and synthesis in ancient or pre-historic times. The use of models (objects, pictures, symbols) representing other things seems to me to be the next step. Thank you for an interesting scholarly article in this subject area. By the way, if there was an ancient word for “spreadsheeting”, I would be happy to learn of it.